Bakersfield Observed: A local kindergarten teacher warns of online home rental scams and who exactly were the Bakersfield Buffaloes? A local kindergarten teacher warns of online home rental scams and who exactly were the Bakersfield Buffaloes? $700 a month. "It wasn't until the third email, in which he explained all utilities would be paid for as well as an application form requesting my credit history that I started to think hmmm.... too good to be true. So I Googled his name and his phone number and was immediately sent to a forum warning me about this exact scenario." * ... BAKERSFIELD BUFFALOS? 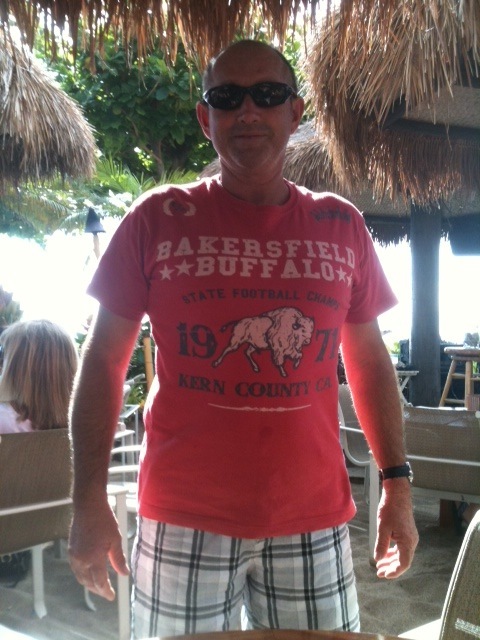 Ted James was at a bar in Maui recently when he noticed a man wearing a T-shirt that read: Bakersfield-Buffalo-State Football Champs, 1971, Kern County, CA. It turned out the man was from Newcastle, Australia, and "had absolutely no idea what country Bakersfield was in. My wife and I, in our brief conversation with him, were able to give him a new meaning for his shirt and where Bakersfield was located. Ha! He was quite impressed that Bakersfield was in California. Mayor Hall would appreciate my efforts! My only question is were the Bakersfield College Renegades called the Buffaloes in the past?" * ... BICYCLISTS: In response to an earlier blog about bicyclists riding against traffic, Stephen A. Montgomery submitted this comment: "Sadly there is a strong motive for bicyclists to violate the California Vehicle Code by riding against the current of traffic," he said. "A friend who rides with the local chapter of the AIA group witnessed a motorist seen laughing as he made sport swooping in as close to bicyclists as he could. He got too close to one causing him to go down. Despite a pack of witness who saw the driver laughing before the impact the judge accepted the tale spun by his girlfriend passenger that he had dozed off! A late friend repeatedly had an all too common experience where morons think it's sport to come up behind a bicyclist so a passenger can smack him in the back of the head with a shoe! The combined speed of the perp's swing and the momentum of the vehicle make for a hard blow that can and has often caused the bicyclist to go down. The bottom line? It's simply too easy for irresponsible and just plain bad people to behave this way without consequence. While bicyclists should comply with the vehicle code they and all of us need a more assertive and positive response from the law enforcement sector." * ... MORE CYCLISTS: And finally there is this from reader Pam Martinez: "I just wanted to comment on your blog about the bicyclists riding against traffic. I just happened to hit a bicyclist doing that exact same thing on Ming Avenue. Praise God, he was not injured seriously, (only) scraped elbows. He did not have a helmet, but did not hit his head! I was making a right turn onto Ming and did not see him. Thanks for sharing your article." * ... NUT FESTIVAL: The Kern County Nut Festival could not have been a success without all the volunteers, but Annette Londquist wanted to thank a special group of young workers. "I am the Kids' Activities Chair for the Kern County Nut Festival. Our area required many helping hands all day. We received that help from the Boys and Girls Club of Bakersfield. What an impressive group of young men and women! Every one of them had a positive attitude, gracious manners and worked tirelessly... I wanted to thank them publicly and let your readers know the outstanding job the leaders of this organization are doing in helping these wonderful young people develop into productive, successful adults. Life is good in Bakersfield with these young people in our midst." * ... BAKERSFIELDISM: Randy Martin says you may be from Bakersfield if you remember "Bob's Burger a hidden dive on Kentucky. Bob's served great burgers and a massive burger beast called the Belly Buster." Billy Bob's was the home of the Belly Buster.